The picture on the right is of a model of the first prototype Spitfire, which flew at Eastleigh aerodrome in March 1936. I have called the Fab Lab that I am setting up in Eastleigh the Spitfire Fab Lab, in honour of the plane. But I have included a picture of a model of the Spitfire, rather than the real thing, because the wooden base on which the model is standing has been routed (the curved shape round the edges) and it is about routing (say “r -oww-ting”) that I wish to write! At Spitfire Fab Lab we have three different CNC routers, a baby one (the ShopBot Handibot), a mummy one (the Shopbot Desktop) and a daddy one (The Blackfoot 8×4). But let’s not rush ahead. For a moment, never mind what a CNC router is or does, what is a non-computer controlled router, and what can it do. Well, clearly you can make just about anything with a router … if you happen to be as skilled as Jeremy. Which I, and most of the rest of us, are not! When using a router you move it left and right, backwards and forwards, and up and down, carefully and skilfully. And a computer, linked to the right sort of router, can do that better than most of us! So, here’s a short video showing a small project that has been made on a ShopBot Desktop. Notice how he says that he designed the gears on a separate piece of software, then loaded that into the software that comes with the Shopbot machine. Even Jeremy Broun might find that intriguing, I suspect! (skip forward to 20″ in to get past the titles). Notice also how he refers to changing the lettering “on the final product” … when you have a CNC router, with the design in software, it becomes much easier to make your product, go back and make some changes in the design, and then make another copy. You might make the prototypes in a cheap material (pine, say) and the final copy in a better wood, or even in metal. My friend, Sarah, was curious as to how this all works, and even though our CNC machines haven’t arrived yet, I do have the software, so I can demonstrate that. My standard demo is to make a name plate, so let’s make one for Sarah. At the end of the CAD/CAM process above I said that we save the design file, and then send it to the CNC machine. Well, that could be the CNC machine that’s in my workshop, or it could be any CNC machine anywhere in the world … and this is another big advantage of “21st Century manufacturing” … you can make design files, and send them to other people to actually make. There’s a website, OpenDesk.cc, where designers create designs and upload them (for free). If you have a CNC machine, you can download that design and cut it out for yourself (or for someone else). This is actually a four=person desk: maybe you just want a two-person desk … you can download the design and modify it before you print it out. But what if you would like a desk like this, but don’t have a CNC machine? Well, there’s a map showing people all over the world who will do it for you. How much they will charge will depend on each maker, and what material you choose. You might choose to have a simple name plate, like Sarah’s above, or a whole house … take a look at our Wikihouse page. So, what machines do we have? The “daddy” machine is a “Build Your CNC” Blackfoot 8×4. 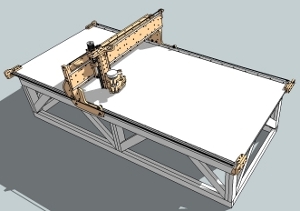 It is capable of cutting an 8′ x 4′ sheet of ¾” (2.4m x 1.2m x 18mm) structural ply. It comes as a kit of parts, and I have a few week’s job to build it when it arrives! It is what we will use to cut the parts to make Wikihouse structures: sheds, greenhouses, garden gazebos, garages, houses … even the buildings to house Fab Labs. Next is our ShopBot Desktop. This neat little machine with a cutting area of 24″ x 18″ (.61m x .46m). However, although you can’t use material wider that 2′ (610mm), there are clever ways of moving longer material through the machine using a registering system. Here’s Ted Hall, the founder of ShopBot Tools, talking about the Desktop, showing a system for cutting parts from a piece of wood much longer than 18″, and also talking about some other key advantages of CNC. Lastly there’s our baby CNC, the amazing ShopBot Handibot, what they call a “Smart Handtool”. When I first saw the Handibot I was blown away by the brilliance of the idea. And Shopbot talked about having the Handibot made by “distributed manufacturing” … much like the network of Makers that you could use to make your Open Dek which we talked about above. I love it James – I had no idea that these ‘bots’ actually used wood; I had it in mind that they were 3D printers and that they printed out stuff. I like this much better and now that I understand that you’re not trying to print a village, I get it! > Want to learn about 3D printing and other 21st C stuff? > making bee hives, and doing electronics and the Internet of Things. > I need people to help: will teach you for free! I’m now back from hols — do you still need people to help? I live in Hiltingbury and have a background in Software Engineering. I’m also interested in DIY. drop me an e-mail, and come on round to see what we’re doing. I have only just found out about FABLAB, you seem to be doing all the things that I’m interested in. How can I get involved? I live about 20 miles away from spitfirefablab. I have access to a woodworking workshop here to make stuff, but there isn’t much interest in anything 21stCentury. I’m really interested in helping/finding out about the project. I’m in Romsey and would love to find out more about the CNC technology you have available. How much did it cost you to get the Shopbot Desktop set up in the UK? I am the mechanical engineering manager at a technology company on the south coast. I have a lot of interest in modern manufacturing methods (CNC/3D manufacturing) both in and out of work. I have a small workshop at home to indulge in furniture and other wood based projects but would love to get more access into CNC. Love the hackspace/fablab philosophy and really interested in your focus on CNC routing….passion of mine too. WOuld love to find out how you are getting on – also get involved and maybe….maybe indulge myself with a few ideas myself. Just stumbled across this website while searching for laser cutting services in Eastleigh. Do you provide laser cutting services? Sorry, no we don’t provide that service.